Removal of Confederate Flags and Monuments: Straining at Gnats? Regular readers of this blog will know that I've been researching my father's family heritage and periodically post my findings at the Somers Family Heritage blog. What you might not know is I discovered my 4th, 3rd and possibly 2nd Great Grandfathers were slave holders. As one who has firmly and consistently denounced any form of racism this information rocked me to the core. In fact, I was so dismayed at the revelation, I almost stopped researching my family tree because I wasn't prepared for the historical truth of my ancestry. You see, I was always taught that my grandfather hid his Native American heritage due to the persecution of the Cherokee. Grandpa was a "half-breed" and looked down upon by others for something he had no control over - his race. It never occurred to me he might have been the grandson of a slave holder. So, after confiding my discovery to friends and asking the good Lord just how on earth could my ancestors reconcile their slave holding to their Christian faith, I finally came to accept it as family history. I'm emphasizing the word history because like it or not, slave holding is part of America's history. Strange as it might sound, two of my Great Grandfather's brothers from Tennessee fought for the Union. 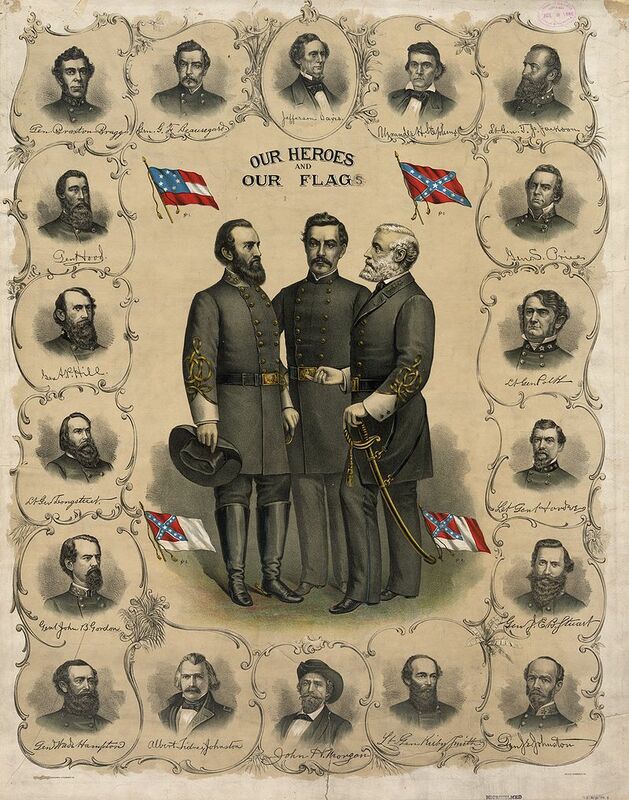 I also know we had family in Nashville that fought for the Confederacy. 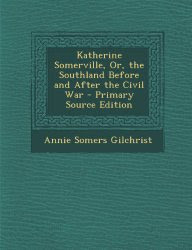 In fact, you can read our Nashville family's account of life before, during and after the Civil War in the book "Katherine Somerville" written by my distant cousin Annie Gilchrist. I've read portions of Annie's book and frankly I was upset with her portrait of life in the South before the War Between the States. I felt she romanticized slave holding and made a few too many snide remarks about northern ladies who looked down on slavery. I even joked to friends about the "fireworks" there would have been at a Somers family reunion between Annie and I, if I had lived during her generation. But I didn't live during the Civil War, nor have I experienced the devastation or destruction of having a war in my home state and losing my home, crops and other means to survive; I wasn't living when Annie's brothers, cousins, and friends were risking their lives and often dying to preserve their heritage. So, instead of defacing Annie's work, demanding it be burnt or removed, I've chosen to learn from the mistakes of my ancestors and do what I can to make things right. I've chosen to forgive Annie's prejudices and my Great Grandfathers slave holdings and accept their failings as humans, while not granting approval of them. Sadly, the recent murder of nine individuals in Charleston by a young man infected with racial hatred has almost been eclipsed by debate over the removal of Confederate flags - symbols from our country's civil war, which leads me to wonder if we are straining at gnats instead of getting to the heart of this matter - a lack of respect for fellow human beings. In 2011, approximately 1.06 million abortions took place in the U.S., down from an estimated 1.21 million abortions in 2008, 1.29 million in 2002, 1.31 million in 2000 and 1.36 million in 1996. From 1973 through 2011, nearly 53 million legal abortions occurred in the U.S. (AGI). Based on available state-level data, an estimated 984,000 abortions took place in 2013—down from an estimated 1.02 million abortions in 2012. In 2011, the highest number of reported abortions occurred in California (181,730), New York(138,370) and Florida (84,990); the fewest occurred in Wyoming (120), South Dakota (600) andNorth Dakota (1,250) (AGI). The 2011 abortion rates by state ranged from a low of 3.8 abortions per 1,000 women aged 15-44 inMississippi (Wyoming had too few abortions for reliable tabulation) to a high of 28.6 abortions per 1,000 women aged 15-44 in New York (AGI). The annual number of legal induced abortions in the United States doubled between 1973 and 1979, and peaked in 1990. There was a slow but steady decline through the 1990's. Overall, the number of annual abortions decreased by 6% between 2000 and 2009, with temporary spikes in 2002 and 2006 (CDC). In 2011, 17% of legal induced abortions occurred in California (AGI). The US abortion rate is similar to those of Australia, New Zealand, and Sweden but higher than those of other Western European countries (NAF). Half of pregnancies among American women are unintended; about 4 in 10 of these are terminated by abortion. Twenty-one percent of all U.S. pregnancies (excluding miscarriages) end in abortion. (AGI). Please forgive our nearsightedness and help us to see the bigger picture that all mankind is made in your image and should be treated with the utmost respect, including those whom we disagree with. Help us to see that life truly is valuable and enable us to love others as ourselves - especially the preborn who don't seem to have any voice in if they will even see the light of day. Help us to learn from the history of American slave holding to no longer dehumanize other groups of people. Forgive our bloodguilt and continued enabling of racial hatred which is still prevalent and can be seen all across America at the abortion clinics. In Lord Jesus' Name I pray, amen. As a total aside, I want to congratulate you on switching to Blogger. Wordpress is way out of order, and couldn't care less about the word of God. Whether they will be judged, God only knows, but God is not mocked. Thanks dora! Sorry for the delay in responding... I've been adjusting to Blogger. :) I hadn't planned to move from Wordpress, but when they openly applauded their homosexual bloggers after subjecting all their members to the rainbow flag on our blog/reader pages, I had no choice but to leave. I've never seen Wordpress brag about their Christian bloggers, and frankly, I feel they could care less about our beliefs.